Defarge explains that Dr. Manette wrote the letter while in the Bastille to explain how he ended up in prison. He then reads the letter. Walking home one night in 1757, Dr. Manette was taken into a carriage by two men, identical twins. From their coat of arms, he learned that they were Evrémondes: Charles's father (who was then the Marquis) and his uncle (who became the Marquis after Charles's father died, and was murdered in Book 2, Chapter 9). The letter tells the story of Manette's imprisonment. The twin Evrémonde brothers epitomize the selfishness and cruelty of aristocratic power. They take what they want, when they want, by whatever means necessary. The men took the doctor to see two patients: one, a beautiful young woman deliriously calling out for her family, and the other, a peasant boy with a stab wound in his chest. As Manette treated the boy, the boy told him that the young woman was his sister. After she married, the two aristocrats decided they wanted her for themselves. So they forced her husband to endure impossibly hard work until he died. Then they took her away and raped her. The Evrémondes don't recognize the individual rights of peasants, the sovereignty of marriage, or the sacredness of female sexuality, which was a huge deal in Dickens's time. They are the worst example of aristocratic tyranny, and, as such, they embody many of the reasons the commoners revolted. The peasant boy and young woman's father died upon hearing the news. The boy then sent his younger sister to a distant, secret place, and, seeking revenge, snuck into the Evrémondes' castle. He confronted one of the Evrémondes, who stabbed him. The boy soon died, but before he did he cursed the Evrémondes by marking the air with a cross of his own blood. The young woman died within a week. The nobles then offered Dr. Manette some gold in return for his silence, but he declined and returned home, disgusted with all he had seen. The curse seals the fate of the Evrémonde brothers. While Charles did not know this story, he sensed his family's dark past when he renounced it in Book 2, Chapter 9. Dr. Manette refused to be bought off by the Evrémondes, despite the danger of such an action. He sacrificed his freedom to preserve his integrity. The next day, the wife of the Marquis (and Charles's mother) visited Dr. Manette. Hearing what had happened, she hoped to find and help the surviving sister of the abused peasant family. She told her little boy Charles that he must someday repay this injured girl. Unfortunately, Manette didn't know where the girl was. That surviving sister, as future events in the novel will show, is Madame Defarge. Ironically, Charles has pledged himself to help this girl, while she blindly seeks revenge and does everything in her power to kill him. Dr. Manette soon sent a letter to the authorities detailing the crimes of the Evrémonde brothers. But the Marquis intercepted and burned Manette's letter. He then sent Manette in secret to the Bastille. Manette ends his letter from prison with a curse on the Evrémondes. Manette tried to condemn the Evrémondes officially and failed—just as he does now, having tried to use his political influence to save Charles. Both governments are corrupt. His curse seals Charles's fate. Incensed at the actions of the Evrémondes, the jury sentences Charles to death. The crowd goes wild. Just days before the crowd cheered Charles as a patriot. Fyfe, Paul. "A Tale of Two Cities Book 3, Chapter 10." LitCharts. LitCharts LLC, 22 Jul 2013. Web. 11 Jan 2019. Fyfe, Paul. 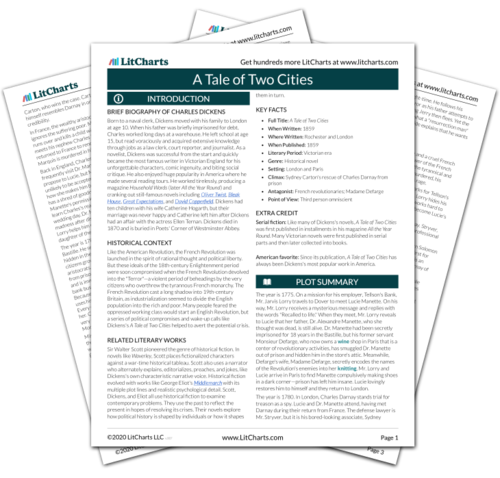 "A Tale of Two Cities Book 3, Chapter 10." LitCharts LLC, July 22, 2013. 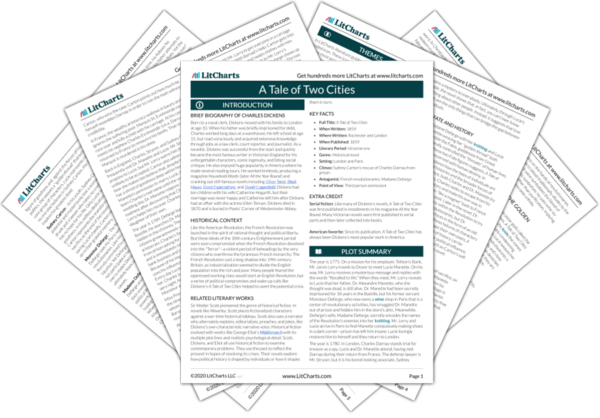 Retrieved January 11, 2019. https://www.litcharts.com/lit/a-tale-of-two-cities/book-3-chapter-10.